When I began to write, I was inspired by the storytelling of Andrew Stott in The Pantomime Life of Joseph Grimaldi and his ability to craft an engaging biographical narrative. 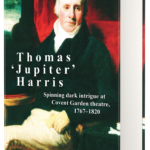 As for a sheer command over historical detail, nothing matches Marc Baer’s Theatre and Disorder which analyses the 1809 Old Price riots at Covent Garden theatre. Time has dispersed the fragments of Harris’s life. I spent fifteen hours of travelling to visit Petworth House, West Sussex, to take a look at a portrait previously owned by Harris. As it was hung high upon a wall in the private quarters, I had to teeter upon the top ledge of a fearsome step-ladder, hold my camera above my head, and hope for the best. It may seem mundane to some, but it was the first time that I have climbed ladders and not fallen from them. And thankfully, a good photograph was taken too. My time at the Folger archives in Washington DC was hugely enjoyable. 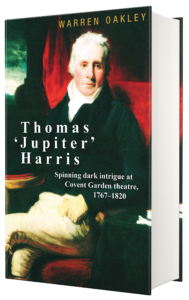 Their collections of theatrical ephemera — and their scrapbooks in particular — promised fresh discoveries about Harris at the turn of every page. And being able to write a well-crafted sentence from such a discovery is always pleasing. Trying to write a biography virtually from scratch, when little is known about the life you have chosen to reconstruct, is difficult. Even the dates of Harris’s life were obscure. Despite being a figure of huge cultural importance, there were no biographies or extended critical studies to draw upon. Even searching for archival material was initially speculative. And when it was found, I had to puzzle out its significance with very few reference points. I spent many hours trying to understand architectural plans at the London Metropolitan Archives. My first book was A Culture of Mimicry: Laurence Sterne, His Readers and the Art of Bodysnatching, published by MHRA (the Modern Humanities Research Association) in their ‘Texts and Dissertations’ series. It is where Harris makes his first, cameo appearance. It was thrilling — and a validation of many, many years of study. It still has pride of place on my bookshelf. As well as having international standing, MUP also has a reputation for publishing studies which are a little bit different, innovative, or unconventional. If any non-fiction book is a ‘first’, then it has a potential home at MUP. It is my first historical biography, so every decision was new. Unlike writing a piece of critical or literary analysis, which follows a certain form of sequential logic from a to b, the vivid recreation of a life sometimes depends upon the reordering or withholding of information — or translating it into the metaphorical. Structurally, for example, some of these chapters begin with an ending — and work backwards from there. While writing this biography, I have accumulated an archive of around 190 letters. I hope to turn this correspondence — between the Harris family and the theatre world over a period of fifty-three years — into an edited collection. These letters expose the negotiations involving the Harris family and their investors, playwrights, performers, and patrons; and, in doing so, include correspondents who were the celebrities of the period, and the power brokers of the political world. Few documents are as revealing as an eighteenth-century letter. 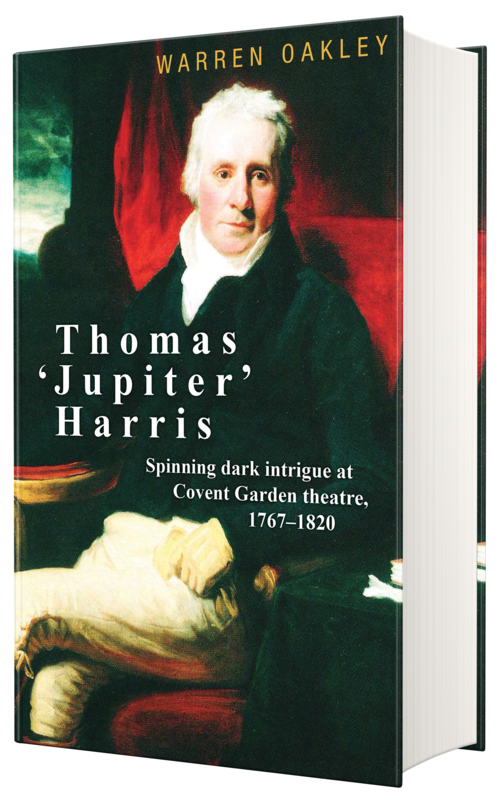 Thomas ‘Jupiter’ Harris: Spinning dark intrigue at Covent Garden theatre, 1767–1820 is available to buy now! Warren Oakley is a former research fellow of the Folger Institute, Washington DC, and visiting fellow of the Houghton, Harvard University. Category: Author Q&A, Blog, History, Theatre Studies	0 Comments.